Discussion about conlanging, specifically (not related, necessarily, to Dothraki). Note: This post originally appeared (in a modified form) at my old blog. As I’m no longer using that blog anymore, I decided to port the post over here (though the original post still exists). As a conlanger and orthography enthusiast, one of the things I like doing is figuring out how to write a language in a different script. In the past, I’ve created dozens of romanization systems for my conlangs (even alternate versions depending on whether Unicode is available), alternate orthographies for some of my languages using the scripts of other languages of mine, even alternate spelling systems for English. And all just for fun! This is the strange life I lead. Recently I came across a couple sites that have been translating the English closed captioning for episodes of Game of Thrones that have aired so far into other languages. One of these sites is translating the English into Russian. From what I’ve seen, though, the Dothraki remains untransliterated (i.e. it remains written in Roman characters). Where’s the fun in that? Here, then, is a suggestion for writing Dothraki using the Cyrillic alphabet. My Russian isn’t great, so take this with a grain of salt (and feel free to amend it or comment on it), but I think it works. I should note that my primary experience with Cyrillic is in Russian, which I studied in college. I’m not very familiar with other Cyrillic systems (cyrillization systems? cyrillicization systems…?) used for the various languages of Eurasia, or how accessible a given character choice will be to the largest number of viewers. Since the original site I found was focusing on Russian, though, I’ve tended to go with what a Russian speaker would recognize over what a Mongolian, Serbian, Ukrainian, etc. speaker would recognize. ch ч I actually like this better than using a digraph (which is necessary in English without resorting to accents or alien assignments). e э I think this is the best solution to avoid the onglide of Russian “е”. g г Always hard; never pronounced like English “h”. h х See comment on “kh”. See alternative below. j дж Funny: English and Russian are opposites here (cf. “ch”). See alternative below. kh х I had two choices, really: Have “g” and “h” spelled with the same letter, or “h” and “kh”. I went with the latter, since “h” is closer to “kh” in sound, and pronouncing a word with “kh” with “h” (or vice versa) will be far less confusing than pronouncing a word with “g” with “h” (or vice versa). See alternative below. q к I have no clever idea for this sound. I figure “к” is closest, so might as well use it (since we already have one confusion built in with “h” and “kh”). See alternative below. sh ш Sound is actually closer to “щ”, but “ш” is a simpler character. th ц Can I get away with this? The sounds are nothing alike, but the place of articulation is close! If not, it’d just have to be “т”, I guess (unless anyone still remembers “ѳ”). w ў In all positions. y й In all positions. ‘ ‘ Or just leave it out entirely; it’s not important. Apparently Serbian uses “ђ” for Dothraki j (or something very close to it), so that might be a nice alternative to the digraph (though I’m not sure if it comes standard on a Russian keyboard). Searching for a possible alternative for Dothraki q led me to one interesting solution. Some languages use “қ” for q, but apparently some of the Iranian languages have replaced that with the digraph “къ”, which I think is perfect! The little “b” character (ъ) is the “hard sign” in Russian’s orthography. It has a very specific use there, but since it doesn’t in Dothraki—and since it would be immediately recognizable to Russian speakers—the usual “к” glyph would be augmented to “къ” for q, making it seem like q is the “hard” version of k—and that’s not too far off! Cyrillic “һ” is a possibility for h (leaving “х” free to be kh), but I’m not sure how common it is. Another possibility presents itself, though. Since “г” is commonly used for [h] in Russian, it could become the new letter for h, and then “гъ” (or “hard г”) could become the way to write g. Kind of odd to think of writing g as a digraph, but it works! Unfortunately, I’ve still found no satisfactory solution for th. It’s a tricky sound to handle in Cyrillic, because it used to exist in a lot of Slavic languages, but was eventually replaced by either [t] or [f]—with the character itself taking over to spell those new sounds. However, if we continue to spell it with “ц”, there’s an amusing little in joke. In Russian (and many other Slavic languages), this character is used for the affricate [ts]. In the episode where Irri is teaching Dany to speak Dothraki properly, Dany practices with the word athjahakar. When she gets it wrong, though, she pronounces it atsjakar. Thus, the Russian character to spell it—if pronounced as it would be in Russian—would lead one to mispronounce the beginning part of that word in the exact same way Dany mispronounces it. Ha! Well, thanks for indulging me yet again. I hope your weekend has been spent in safety, and far away from the madness surrounding shopping centers around this time of year. Fonas chek! As we’re approaching the April 1st premiere of season 2 of Game of Thrones, I thought it’d be worthwhile to take a look back at the early days of Dothraki. The spellings in the books are canon. Different spelling = different sound. The resultant phonology should be linguistically sound. The resultant phonology shouldn’t be too difficult for an English-speaking actor to pronounce. As a result of the above, the hr in hranna is pronounced differently from the rh in rhaggat, and so forth. There were a couple of changes I made, though, and they’re worth discussing. One minor one was a spelling change that can be illustrated nicely with one name: Jhiqui. That’s how her name is spelled in the book. I didn’t quite know what to make of jh when I first saw it. It contrasts with j by itself (consider haj and Jommo), which means that jh should be a different sound from j. Since the “h” in English tends to make stops into fricatives (cf. “t” > “th”) and move the place of fricatives towards the palate (cf. 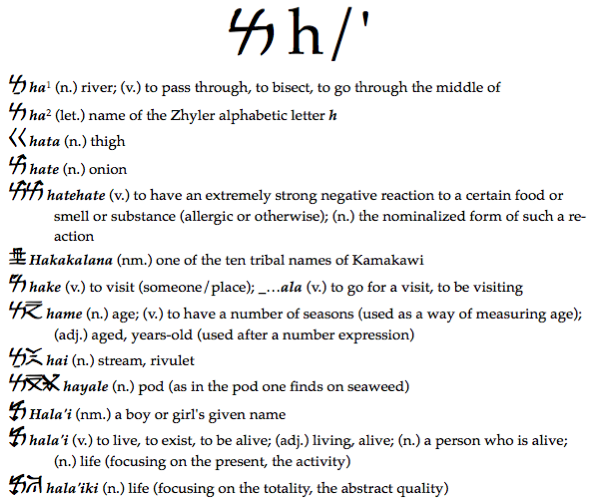 “s” > “sh”), I thought it’d be reasonable to assume that jh stood for a voiced palato-alveolar fricative ([ʒ], like the “z” in “azure”). I may have been influenced by the fact that [ʒ] is my favorite sound, but I still think the supposition is a reasonable one. That, however, has not proved to be the case. Not only did some of the actors have trouble with zh (often pronouncing it as if it were z), but I’ve also heard from others that zh is problematic. There are two reasons I can think of that an English speaker wouldn’t do well with zh for [ʒ]: One, they don’t know how the digraph ought to be pronounced (at a glance), or two, they misinterpret it as a sequence of z and h.
At the heart of both problems, I believe, is the nebulous nature of the phoneme [ʒ] in English. There are no minimal pairs (or at least no common ones. Perhaps if someone knows of one, they can leave a comment), but there are near minimal pairs in “pleasure” and “pressure”. (Ooh… Actually, what about “azure” and “asher”?) Additionally, there is no systematic way to spell the sound. It appears as “ge” in “rouge”, “g” in “genre”, “s” in “leisure”, “si” in “fusion”, “z” in “azure”, “j” in “Taj Mahal”, and part of “x” in “luxury”. English has a funky spelling system, but for just about every other consonant phoneme, there is a definite, basic spelling. Not so with [ʒ]. Daenerys has suggested that it’s more difficult to get zh right before a and o; less so before i and e. This makes intuitive sense because zh is a palatal sound, and i and e are front vowels. She suggested that zh might be spelled zhy, but perhaps just in front of a and o—which does make sense. I’d thought previously of spelling the sound zy. For the sake of neatness, though, I’d want to respell what is now spelled as sh as sy, which doesn’t seem ideal… As a result, I think we’re stuck with zh. Anyway, the whole point of bringing this up is that I decided to respell jh as zh (thought it’d be easier. Oh well). This doesn’t mean, though, that the spellings in the books ought to change. Since it’s a one-to-one correspondence, jh is just the book’s way of spelling Dothraki zh (or vice-versa). This means that if anything from modern Dothraki with zh shows up in the books, it would be spelled with jh, e.g. jhavvorsa, mahrajh, vejhven, etc. Oh, and also present in Jhiqui’s name is the change from qu to kw, which shouldn’t be too controversial. Beyond that, though, I made a couple of other changes which are worth noting. The letters p and b occur almost nowhere in Dothraki. In fact they only appear in two places: In the names Pono and Bharbo. Given the sound change I proposed (a merger of older p and f as well as b and v), it seemed reasonable enough to have them survive only in names. 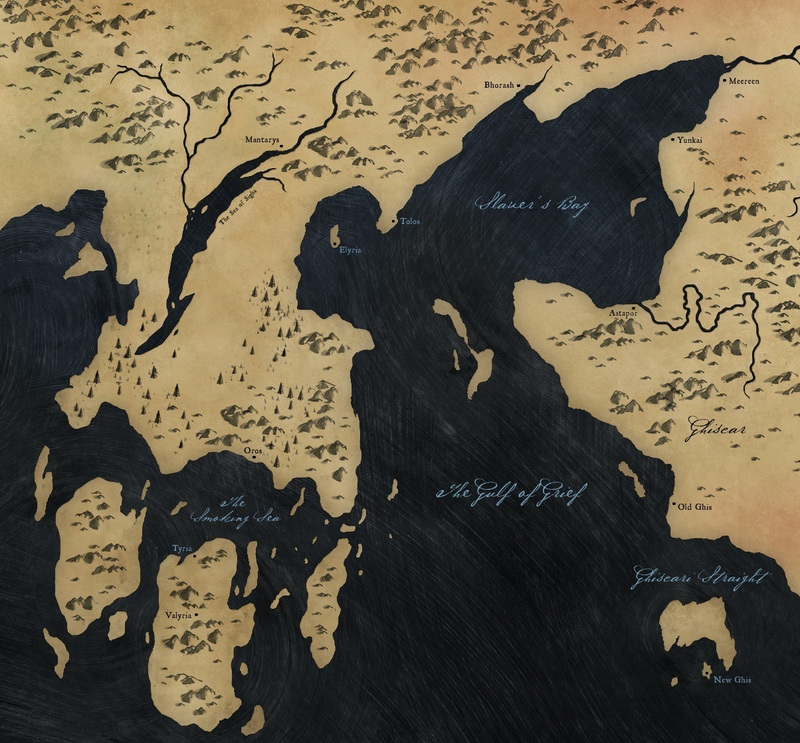 As the Havazh Dothraki is large, it seems reasonable to assume that there are probably several different varieties of Dothraki spoken by different khalasars. They’re probably mutually intelligible (being able to communicate in Vaes Dothrak is motivation enough to maintain communicability), but it seems likely that some varieties may have preserved the p/f and b/v distinctions, meaning that this is a dialectal variation that Dothraki speakers everywhere are likely aware of (kind of like the t/k distinction in Hawaiian). While for the most part the schema I came up with above worked out pretty well, there were a couple places where it may have caused more problems than it solved. One obvious one is the word khaleesi. Going by Dothraki’s spelling system, the word should be pronounced [ˈxa.le.e.si] (or KHA-lay-yay-see). More often than not, though, it’s pronounced [ka.ˈli.si] (or kah-LEE-see). There’s not much to say about the [k] and the stress (bound to happen), but the “ee” part is troubling. It seems quite sensible that any English speaker would pronounce the “ee” as if it were like the “ee” in “keep” or “seem”. What wasn’t sensible, perhaps, was my idea that it wouldn’t be any trouble to switch over to the “real” Dothraki pronunciation (i.e. pronouncing it just like it’s spelled). Evidently they made an executive decision on the show to pronounce it like the “ee” in “keep” even when it’s spoken in Dothraki. And I suppose I can’t blame them. It does seem reasonable enough. If I had it to do over, perhaps I would’ve bent the rules just a little bit and made the official spelling khalisi—or maybe even khalissi to get the stress right. Oh well. Live and learn. One I’ve mentioned before elsewhere (but not here, I believe) is George R. R. Martin’s peculiar pronunciation of the word “Dothraki”. Those who have seen him in person know how he pronounces it, but if you haven’t, he pronounces the last “i” as if it were like the “i” in “bike” or “fungi” or “alumni”. I was shocked the first time I heard it. I thought I simply misheard him, but no: His pronunciation is consistent on this point. It does certainly change the character and flavor of the word quite a bit. As far as I know, though, he’s the only one that pronounces the word this way, so I didn’t feel too bad about giving it the usual “ee” pronunciation. Finally, there’s the issue of the vowel sequence ae. I honestly had no idea what to do with this. I thought I’d be well served in treating the two as separate vowels (as in Spanish “caer”). It seems, though, that the preferred pronunciation is like the “a” in “gate”. Aside from the variant of “Rachel” spelled “Raechel”, I don’t think we have that sequence pronounced that way in English, so I’m not sure if I would’ve guessed that that was how it was “supposed” to be pronounced. On the show, most of the time they went with standard Dothraki pronunciation. The one major time where they didn’t was with the pronunciation of the name “Rhaego”. That, however, is Dany’s old brother’s name (Rhaegar) with a Dothraki -o added in place of the Valyrian -ar, so it’s not too bizarre that the spelling has a different pronunciation (it’s not a true Dothraki name, after all). Well, I had intended all of this to be rather the introduction to a longer post. The word count thingy at the bottom of this post tells me I’m up over 1400 words already, though, so I suppose I’d better bring this to a close. I’ll likely revisit this topic some time in the future, though, as there’s more to be said. Until then, fonas chek! Taking a break from grammar, I thought I’d write up a little guide about how to write Dothraki using the Arabic script. It’s actually mostly written up, so all I have to do is transfer it over to the blog (heh, heh…). Of course, one might wonder: Why would I already have a guide for transcribing Dothraki using the Arabic script? For that, we have to go way back to the days before the Game of Thrones pilot was filmed. Back then, I think the general feeling was that the show would be picked up for at least one season (it wasn’t official, of course, but we all kind of had a gut feeling), and at the time (back when Daenerys was being played by Tamzin Merchant), the Dothraki scenes were all being shot in Morocco—and I, at least, thought they would continue to be shot in Morocco. In Hollywood, though, radical sweeping changes can happen overnight, and soon Tamzin Merchant was replaced by Emilia Clarke, and Morocco itself was replaced by Malta, and the rest is history. During the Morocco days, though, the word was that many Dothraki extras would likely be Moroccan, meaning they might know French, and would likely know Arabic, but might not know English. Since the Dothraki romanization was designed with English speakers in mind, I decided it would make sense to devise a French-inspired romanization system, as well as one utilizing the Arabic script. I detailed both of these systems in the original materials I sent to Dave and Dan. I’ll probably write up the French romanization system I came up with later, but for now, let’s take a look at the Arabic system. First, some important facts about Arabic writing. The system is, technically (as it’s used today), an alphabet, but it began its existence as an abjad. An abjad is a writing system that treats vowels as incidental, encoding only the consonants. Thus, in an Arabic word like kataba, “he wrote”, you generally write the equivalent of ktb, with the vowels being assumed. As it is now, there are certain vowels that must be written (long vowels), and there’s a secondary set of diacritics that can be used to optionally write all vowels, so it really looks more like an alphabet, but it’s abjadic history is evident to any who use the script. Unlike most Western scripts, the Arabic script is written from right to left (which is a nightmare if you want to drop a word of Arabic into a predominantly English text, let me tell you), and most of the characters connect to one another (as with cursive writing in English). It’s also, in my opinion, gorgeous. I fell in love with the Arabic script the first time I saw it, and am glad to have had the opportunity to learn the language and use the script (also is useful to be able to read it). As in Arabic, there’s no distinction between y and i. One choice I made was to mirror that with w and o (in Arabic, w and u). The character و is often used for o in borrowings (e.g. دبلوم “diploma”), so I figure all it would take is a note that و is always pronounced [o] when used as a vowel, and Arabic speakers would get it right. It was quite tempting to render zh as ج, but most speakers actually have something closer to j for that, so I resorted to using a non-standard character ژ, which I hoped would be recognizable. Arabic speakers will notice that I used ح rather than ه for h, even though the latter is closer to the Dothraki h in most places. The reason is (thinking back to the actual Moroccan extras, remember), I was hoping they’d actually use the Arabic sound ح which I thought would be too difficult for English-speaking actors. I’d always imagined that sound in particular when creating and working with Dothraki. The character گ is the one I see most often for g (probably because it’s used in Farsi), but my brother-in-law, who’s been to Morocco, said they use ݣ, so I went with that. Of course, as with Arabic, gemination is indicated with a shadda above the consonant in question. It looks like a little w (دّ). Hash yer vineseri dothrakh ataki kishi, zhey shekh ma shieraki anni? Ha! That was so much fun. I realize I may be the only one who appreciates this, but despite the vowel clusters of Dothraki, I always imagined it written in the Arabic script. Even though it’s a pain in the choyo to write it out using Unicode, it’s fun to see it on the screen. 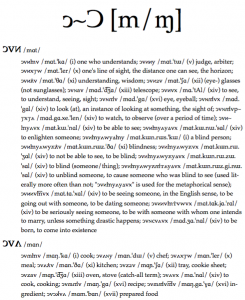 This thread brings up a good question: What is ‘lexical form’ for Dothraki? What is the citation or dictionary form of a given Dothraki word? What is the bare stem in Dothraki? I’ll try to answer both questions. To begin to answer both of them, first I’ll go over how the language is built. There are many different ways to build a language (and by “build” here I don’t mean construct so much as build up, or flesh out), and I’ve used different methods for different languages. Two different methods can be illustrated by glancing at the dictionaries of two of my other languages: Kamakawi and Zhyler. As you can see, in Kamakawi’s dictionary a single word is used as the head of each entry, and related words that differ in form get a new entry. Each root, then, gets its own entry, and words derived from that root (usually via noun class suffix) is listed under that entry. The idea for this type of dictionary came from Arabic, whose dictionaries are ordered alphabetically by triconsonantal root (which, if you know Arabic, makes a lot of sense). As I think I mentioned somewhere, Dothraki is built in the same way Zhyler is (I like to think of Dothraki as being run on a Zhyler engine). Even though the languages are radically different, I flesh Dothraki out in the same way I flesh Zhyler out: by starting with a root and deriving words from it. 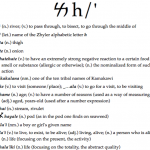 The reason this works well for me is that even though Dothraki doesn’t have noun classes the way Zhyler does (Zhyler has 17; Dothraki nouns, rather, fall into one of two broad classes: animate or inanimate), separate word forms tend to look different from one another, and are built in unpredictable ways. This is on account of Dothraki’s “pseudo-classes”, as I like to call them. Final vowels in Dothraki often serve no function other than to distinguish words from one another (one can easily imagine them dropping off some time in the future, as many word-final central vowels did previously). Many of these final vowels for inanimate nouns, then, form these pseudo-classes that have nothing in common with each other other than form (though there are patterns that hold if one considers a subset of the lexicon). By grouping such words under a single root, one can see how a given root has been fleshed out, and a single word will often make more sense in the context of its root than outside that context. Another reason grouping words together by root makes more sense for Dothraki is that often words are not derived from one another, but derived directly from the root. As such, related words may have definitions that don’t look anything alike. By grouping them under the root, it’s easy to see that, ultimately, they come from the same source. One of these roots ends in a vowel; the other ends in l. Can you tell which is which? Absent of some other mechanism (like a hyphen or a period), there’s no way. However, if you know the root of hoyalat is hoyal and the root of indelat is inde, then by simply having the infinitive, one can fill out the rest of the verbal paradigm. 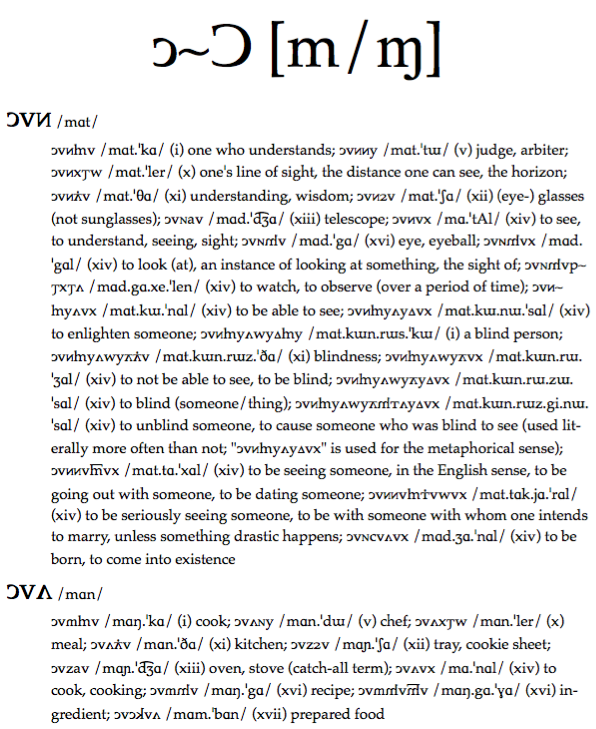 Aside from that, the reason I chose the infinitive as the citation form for verbs is that it’s fairly stable. In most cases, the singular past tense of a verb will be the simplest form of the verb, but it will often look like another word form (for example, haqe is an adjective which means “tired”; it’s also the past tense singular of the verb haqat, which means “to be tired”). For that reason, it makes more sense to use the infinitive which will (almost) always be unique. Bearing in mind that the non-finite forms for a verb in Arabic often look radically different going from verb to verb, the third person masculine singular past tense form (which, given Arabic’s writing system, is written with just the three consonants of the root) is the obvious choice for representing the verb—plus, that form (CaCaCa, where C stands for a consonant) doesn’t occur anywhere else in the language (say, as a noun). It was made for dictionaries. For Dothraki (to finish up the discussion of verbs), if you don’t list the root, it’s probably best to set off the infinitive suffix from the root (e.g. inde.lat and hoyal.at). Since Hrakkar brought up the Dothraki vocabulary list on the wiki, though, one can achieve the same effect by also listing the past tense singular form of the verb. The reason is that the past tense will be either the bare root, or the bare root plus -e. By comparing the infinitive and the past tense, then, one will know for sure what the root is. For nouns, in addition to knowing whether a noun is animate or inanimate, one will also need to know a couple pieces of extra information (for some nouns, at least). For inanimate nouns ending in a vowel, there are two broad classes which I call A and B. Class A nouns lose their final vowel in the accusative; class B nouns take an -e in the accusative. Certain other nouns will have a modified accusative form (so the accusative of tolorro, “bone”, is tolor). And (a bit of new information), there are also a very small number of irregular animate nouns. These nouns all end in i (actually a vowel followed by i). These take vowel-final animate noun case endings in all cases, but in the accusative, the i becomes a y. One noun like this is mai, “mother” (so the nominative plural is maisi, but the accusative plural is mayes). All right, this short response has gotten unruly and taken up much more space than I intended, so I will cut it off here. If you have questions about any of the above, feel free to ask in the comments. If you’ve read this far, you’re a real davrasok. Hajas!